We will take time to celebrate our freedom of speech, allowing each person three minutes to speak on any subject they wish to discuss. The middle school and high school youth will pause their Cosmos curriculum this week to participate in Soapbox Sunday with the adults in the sanctuary. Exercise your first amendment right! 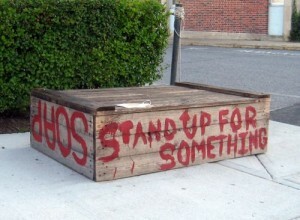 Come and take a turn standing on the soapbox and voicing what’s on your mind.